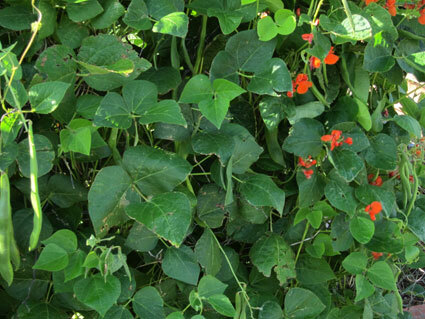 This perennial climber lives for 7 years and produces delicious large beans. This species originated from the mountains of Central America. The vine can grow to two meters or more in length, the green pods are edible whole before they become fibrous, and the seeds can be used fresh or as dried beans. The starchy roots are still eaten by Central American Indians. In the UK, the flowers are often ignored, or treated as an attractive bonus to cultivating the plant for the beans, whereas in the US the scarlet runner is widely grown for its attractive flowers by people who would never think of eating it.